Have you ever met someone who listens so intently that you find yourself saying cleverer things than you would have otherwise? If you have, then you know the gift that Momo brings her friends. She listens so well, that she helps her friends hear themselves. She has time in abundance to listen clearly and this becomes a saving grace for the entire world. Momo shows up one day in an old amphitheatre, wearing an oversized men's coat with lots of pockets. She has run away from a children's home and convinces the people she meets to let her stay. She becomes the referee of the neighborhood, helping neighbors resolve their arguments and augmenting children's play just by listening. Her listening is a direct threat to the grey men who are taking over the world. Real listening will reveal the emptiness inside them and prevent them from deceiving people. The grey men have convinced people to bank their "extra" time with them, with the promise that their investment will double. They really use the stolen time to perpetuate their empty selves. Most people who get swindled by the grey men don't even remember their conversation. Momo does. But Momo has a hard time convincing the people that rushing about is actually causing them to lose time because people are so busy they don't take the time to listen or talk to Momo anymore. It isn't until Momo meets Master Hora, the keeper of time that she has a fighting chance to save the world. The book starts out slowly, sharing specific fantasies that the children play. This feels appropriate since the book is all about savoring time, not saving it. Hardly anyone has heard about this book, unlike Ende's more well-known Never Ending Story, yet it should be a classic. McSweeney's has saved it from obscurity by reprinting a 40th anniversary edition. It has the same innocent charm and gentle critique as The Little Prince. I picked this up again because I have found myself habitually counting down my time. Counting down to what? I had forgotten what it is like to be a child and have endless hours stretching ahead of me to fill with play, friends, and ideas. 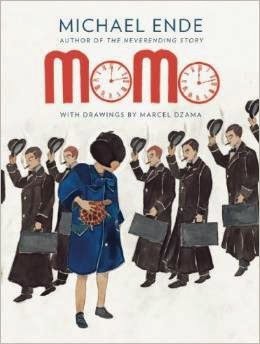 Momo gives her friends and by extension, the reader, the power to enjoy each precious second of our lives instead of winnowing away at the next big thing, whatever that might be. The drink to pair with this story is Hour Blossom Tea. Master Hora shows Momo that hour blossoms are how each person's time manifests itself, each blossom blooming more beautiful than the last. To best enjoy this tea, give yourself an hour to drink it.